JetBeam adds more lights to the RRT series of, this is the fourth in the series, the other are (Danish reviews): RRT-0, RRT-1, RRT-2. This time it is a big and poweful light, it is in the usual good JetBeam quality with HA (Type 3) surface and has the usual problems (for HA) with keeping the color consistent between parts. The light is turned on/off with a forward switch on the tail, the brightness is adjusted with a ring (Like the other RRT lights), this time with 8 positions. In addition to 7 brightness settings it has two flashing settings. 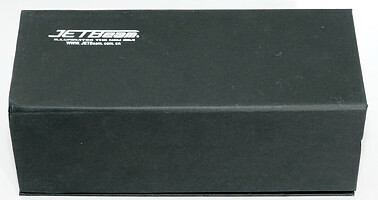 The light arrives in a black cardboard box with magnetic lock and a nice finish. 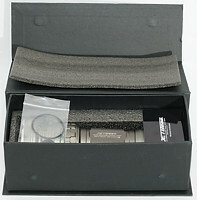 In the box is a serial number and warranty card, 2 spare O-rings and a spare rubber boot for the switch. No manual is included, probably because this is from the first shipment. 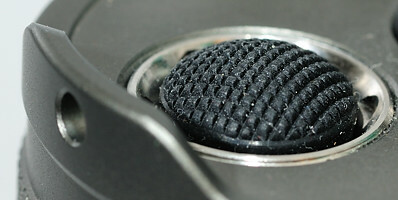 From the front the smooth reflector can be seen with a powerfull led in the center. 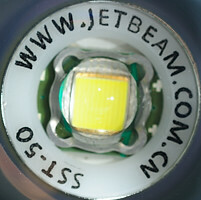 There are no doubt what led JetBeam is using, the SST-50. 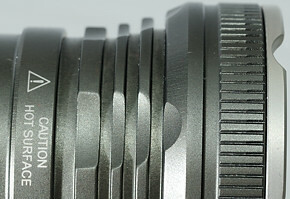 Like many other JetBeam lights the bezel is stainless steel, i.e. the front can take rough treatment. The head has cooling fins and a warning that it can get hot (There are some limits to that, see further down). The ring is without any markings, but that is not very important, turn it one way and the brightness increase, the other way and brightness decrease. The step after full brightness is strobe and the lowest setting is either beacon or low. The ring has 8 positions, with good click stops, it is possible (easy) to turn the ring with the same hand that holds the light. 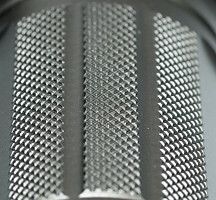 The body has a nice knurling and because the diameter on the body is a bit smaller than the ends, the light will not slide int the hand. The point on the body is used when mounting the fitting for the weapon mounting and handle. The thread on the battery tube is coarse but feels smooth. 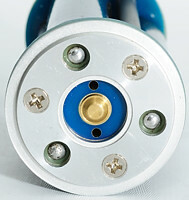 Both the thread on the battery tube and the tail end is anodized, i.e. loosen the tail will lockout the light. 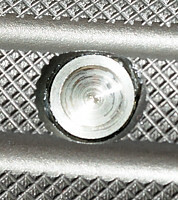 Looking into the battery tube, the spring behind the head can be seen, but opposite other RRT lights, it is not hidden under a cap. There is a reason for this. On the tail of the light is both a on/off switch and a connector for a pressure switch. The on/off switch is a normal forward switch, but it does not directly turn on the light. Both the pressure switch and the on/off switch controls a electronic switch, i.e. 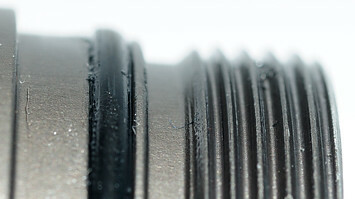 no wear due to high current or power loss in the cable for the pressure switch. This is a very good design. A electronic switch needs power, I will explain how this is done in a moment. 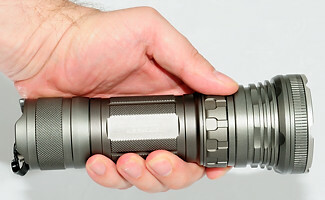 The light can tailstand, but only if the cover on the pressure switch is removed. There is a hole for lanyard, but none is supplied with the light. 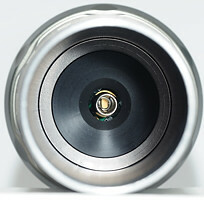 A look into the tail, shows the spring and a ring also with a spring, both has connection to the battery magazine. 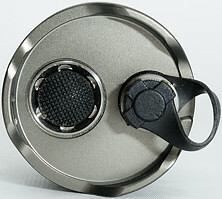 Here is the battery magazine, it is designed for 3*18650 or 6xCR123 batteries, the light can use both combinations. The design feels very solid, with metal connections between front and back and metal plates on the front and back end. Here is one end of the battery magazine, the other end looks exactly the same and the holder can be used either way in the light. The center pole is + and the metal around the + pole is the - pole, i.e. both ends has both a + and - pole. 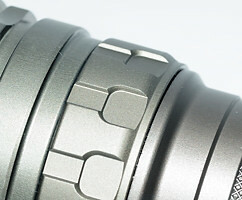 This design is also the reason that there is no cap on the springs in the light, they must center around top of the + pole. 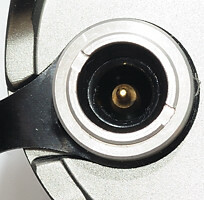 The spring in the tail has connection to the - pole and the ring has contact to the - pole, this way there are power to the electronic switch. With this design of the battery magazine it is very important to keep spiky metal parts away from it, when changing batteries, to avoid shorting the batteries. A look at the poles inside the battery magazine shows that they are raised a bit, i.e. the light can also use flat top batteries. 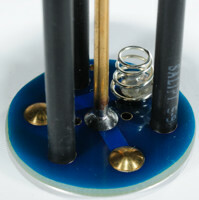 Here is the 3 main parts of the light. I was very surprised with the good throw on this light, it might be the best throwing SST-50 light to date (But I have not yet done a direct comparison to the Catapult). 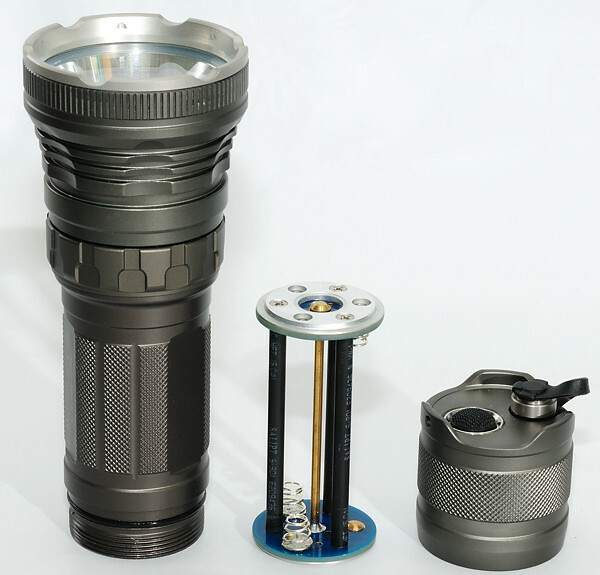 The construction of the light is solid and with 3 batteries it also has a good runtime. 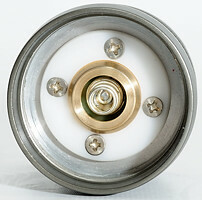 The disadvantage is the weight (See comparison) and the diameter is a bit large. 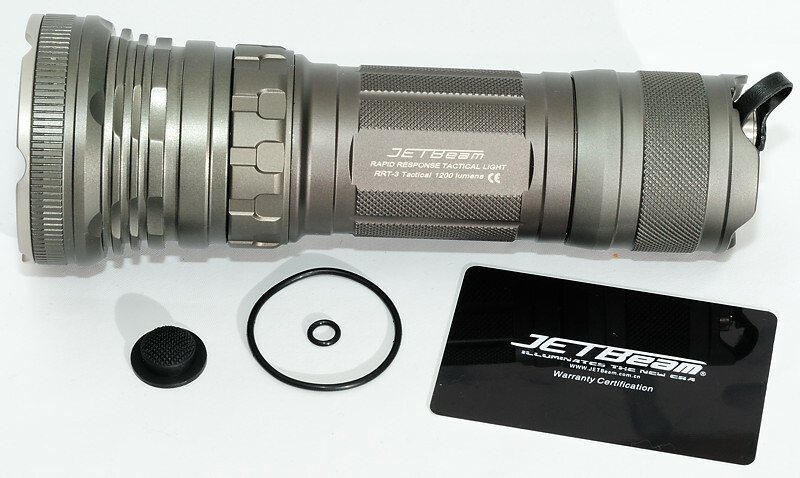 Details like thermo sensor, electronic switch and very solid battery carrier that works both ways, shows that JetBeam has done a very good job on designing this light. The light uses a buck converter that works from 18 volts down to 6.5 volt, where the light turns off. 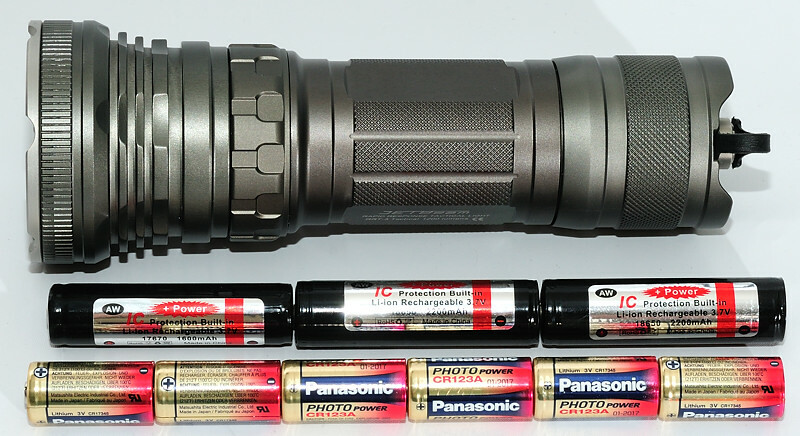 This makes it possible to use the light with both 3x18650 LiIon or 6xCR123 batteries. 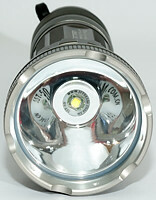 The light uses a Luminus SST-50 led. Measuring on the pressure switch connections shows that only 40uA is used to turn on the electronic switch. The above measurements are done with 3x18650 batteries. Because my runtime measurements was shorter than expected I did an analyses of the batteries and a battery was down to 1400 mAh, in the second column with measured runtime I have scaled the values to 2200mAh. The regulations is interesting and I will look more on it in the following measurements. Here is the measured runtime for some of the levels, it has good stabilization, but the light just goes out when the batteries are empty. 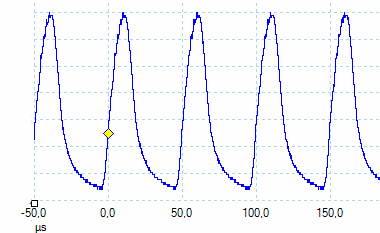 The light uses PWM on 20 kHz, but due to some smoothing it also works as a bit of current regulation, all 5 traces with brightness uses the same scale and can be directly compared. The first two is with brightness #2 and #3. Note: the PWM percent is only a rough estimate, the slow rise and fall times makes it difficult to get exact values. Brightness #4 og #5, on #4 the brightness is nearly up to maximum and regulation is done with pwm. Last one is #6, high is not included, it is just a line. 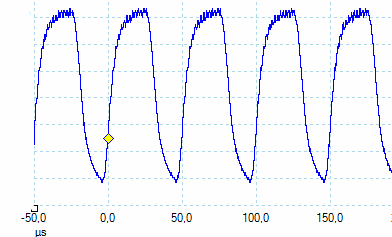 Here is a voltage sweep at high, it shows the current consumption and the regulation in brightness. 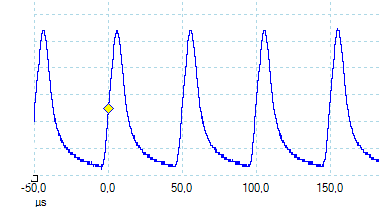 The light has very good regulation, the output drops a bit due to heat, but I did take a lot of breaks during this measurement to avoid this. 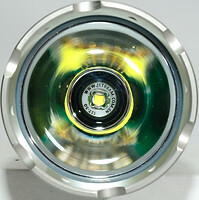 The light uses 16 watt at 6.5 volt and 18 watt at 18 volt. 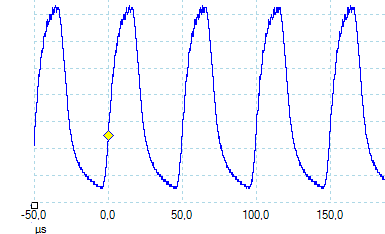 At lower brightness, the regulation does suffer a bit, this curve is from #2 brightness. There is a surprice at low brightness, there is no regulation. Stobe is changing between different frequencies, I measured 5 Hz, 7.2 Hz and 13 Hz (But here might be other), each 1.4 second. The light is on 50% of the time. Note the increased brightness at the start of each flash, my brightness measurement is from there. Beacon is a flash each 10 second, the flash takes 1.3 second. This setting is shared with the lowest brightness setting, a fast switch from low to #2 and back to low will change between low and beacon. During my tests the light got hot (It was mounted in a holder without any cooling), this triggered a temperature warning, a 0.8 second flash each 2.8 second. The curve shows where it changes from normal to warning. This warning does not trigger easily, a 20 minute run lying on a table, at full brightness with 18650 batteries at 24 degrees did not trigger it. Each time I have triggerede the warning the head temperature has been above 50 degrees and using 6xCR123 is more likely to trigger the warning. 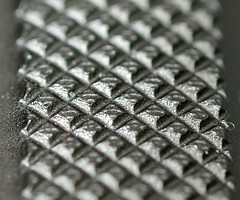 I like this protection, this means that the light will not cook itself if left on a table or in a bag at full power. 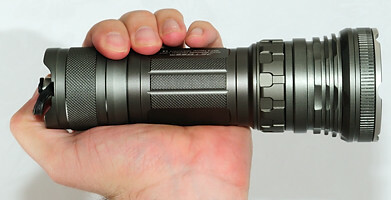 For comparison with other lights and beamshots see here. The used LiIon batteries was only 1400 mAh, not the rated 2200mAh. На диодах XM-L такой бывает? На XLM потеряется часть мощности,тогда уже на трех. Вот мой на хмеле. И мощность никуда не теряется :) а только наоборот. Решил заглянуть в темку. Ах как я тогда хотел такое чудо аж на 1200lm! Это был предел мечтаний. Кто бы мне тогда сказал, что сейчас наключник может 1klm выдавать) Поверил бы я?